I talked about some quick noodle recipe in my last post, and I'm still going to talk about noodle in the post. 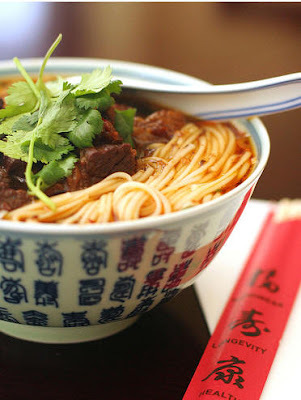 There is generally two kinds of noodles, soup noodle and fried noodle, which one do you favor ? Acturally, I like them both. If I wanna bring noodle home from a restarants, than I have to choose the fried noodles. The Chinese like their noodles long and slippery, the better to slurp down noisily. They're especially fond of wheat noodles, which they use in soups, and wheat and egg noodles, which they use in stir-fries and chow mein, their famous fried noodle dish. Rice noodles and bean threads are also popular. I had Chinese fried rice noodles (aka chow fun and kway teow) for dinner tonight which are stir fried rice noodles served in a meat sauce with beef, fish, prawns, fried fish cake and Asian vegetables. Usually, thick rice noodles are used for this dish. Which one is simple to make. I think both is simple, but the soup noodle may be more healthy to cook, since the fried one need more oil and more fry work, which may emits oil mist, which ladies would be hate. When fried, the noodle tastes better, when in the soup, the soup is great together with the noodle. Anyone Can Cook - Fun Chef Movie "Ratatouille"